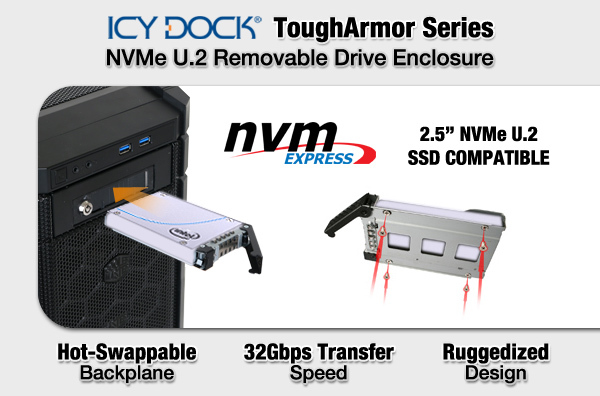 The two most common form factors for NVM Express (NVMe) are M.2 (NGFF) and 2.5" laptop drive. M.2 is a compact form factor, a single circuit board utilizing the M key connector. On the other hand, the 2.5" laptop drive form factor utilizes a newly developed connector, U.2 (SFF8639), designed for enterprise usage. While both transfer at the same speed, there are certain advantages of using a U.2 drive over M.2. Let us explore. Recent advances in non-volatile data storage have resulted into the widespread usage of Solid State Drives (SSDs). 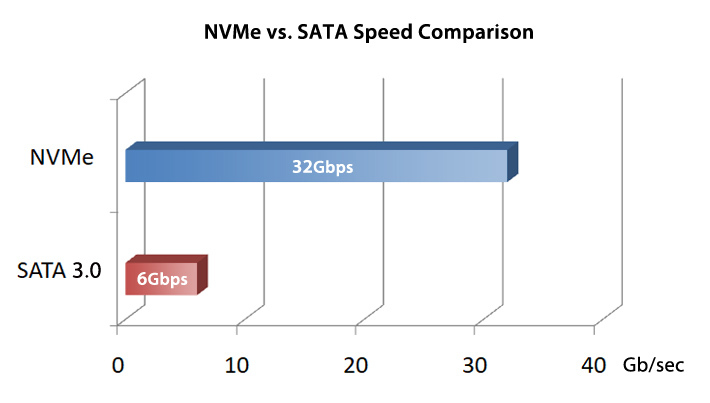 These SSDs have pushed the limits of the SATA 6Gb/s connection standard and the rise of the PCI-e Non Volatile Memory Express (NVMe) 32 GB/s connection standard removes this speed bottleneck for SSDs. PCI-e NVMe is up to 4 times faster than SATA connection and this bandwidth can be easily be utilized with the ever growing amounts of data created. What are 2.5" U.2 Drives? 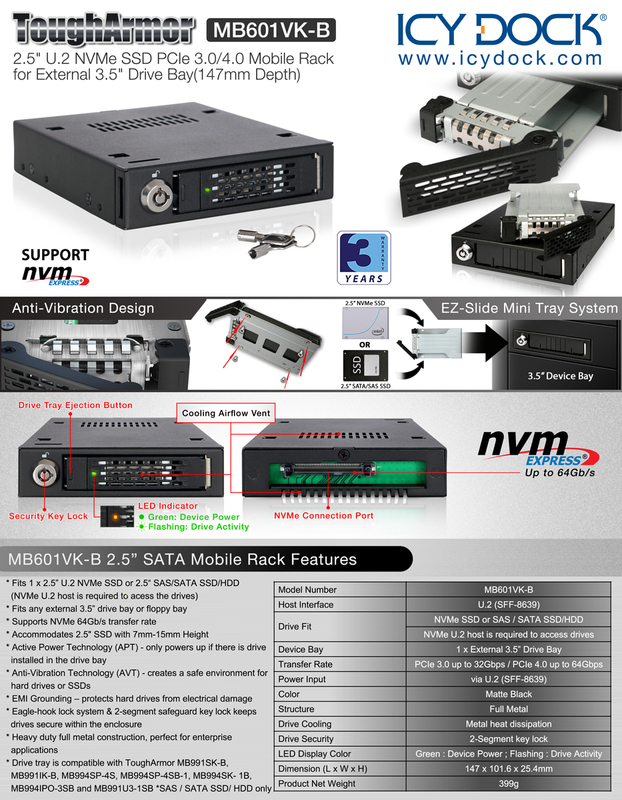 2.5" laptop drives (we will call it U.2 drive) have the manageability of a physical drive. While M.2 has the advantage of being a smaller form factor, its use of an exposed circuit board which can easily cause static damage when installed on a motherboard, makes it unworthy in the enterprise sector where drive accessibility and longevity is critical. On the other hand, U.2 drives are designed with a protective metal shell that encloses the circuit board and can be handled just like a regular 2.5" hard drive. It allows the U.2 drive to be easily and safely swapped out the system constantly without damaging the drive as well as your important data. Lastly, thanks to its 2.5" form factor, system builders do not need to adapt to a new form factor which would introduce unnecessary complications. With U.2 drive's universal 2.5" form factor, and fully enclosed protective casing, it's easy to see why the U.2 NVMe drive standard is the clear choice for the enterprise sector. 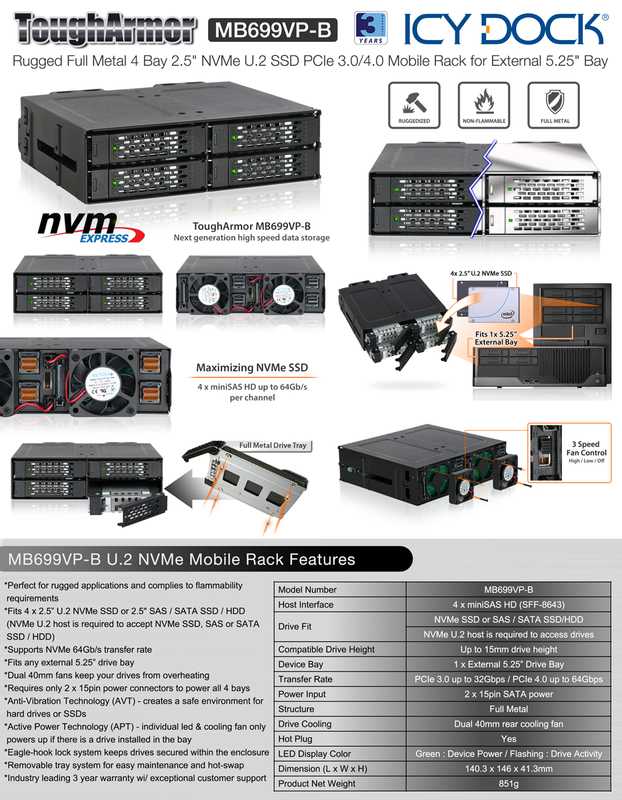 And it is also why ICY DOCK became the pioneer in designing the first hot-swappable U.2 drive cages, ToughtArmor MB601VK-B and MB699VP-B (Available in Mar, 2018), specifically catering to U.2 NVMe SSDs. While using it, these cages keep your drives safe and cool in its rugged full-metal enclosure, and allow you to hot-swap drives safely and securely without the hassle of opening a case or unscrewing it from a drive rack. It lets you fully enhance your workflow operations with blazing fast NVMe U.2 drives, while retaining the convenient access of a 2.5" form factor. Needless to say, if you’re looking for improved drive performance in a quick and easy hot-swap bay, the MB601VK-B or MB699VP-B in combination with U.2 NVMe drive standard is the right choice for you. Copyright © 2018 ICY DOCK. All rights reserved.